We’d love your help. Let us know what’s wrong with this preview of Bless My Kindle by Jamie Downham. 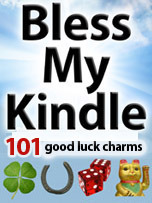 Bless My Kindle will load your beloved e-reader with 101 of the most blessed symbols around, ensuring they are never lost, stolen or dropped in the bath (well, fingers crossed). Experts have been working around the clock to deliver the very latest in cutting-edge charm technology. And thanks to its in-depth ‘Albatross to Yin-Yang’ encyclopedia of The world’s luckiest e-book! Experts have been working around the clock to deliver the very latest in cutting-edge charm technology. And thanks to its in-depth ‘Albatross to Yin-Yang’ encyclopedia of good luck, you will also learn why the four-leaf clover is so special, where touching wood comes from, and why beards were once thought to be blessed. Available exclusively for the Amazon Kindle (and the many devices that offer Kindle apps) this remarkable e-book aims to bring you all the charms you need to keep your e-reader – and that treasured book collection – safe from harm. All at a fraction of the cost of tiresome insurance. So polish up the horseshoe, make a wish on that ladybird, and crack open the fortune cookie for this fascinating new book. And be lucky! To ask other readers questions about Bless My Kindle, please sign up.